“That coworking thing, what is it?” My father asked at the beginning of this adventure. That’s when I realized that not everyone is comfortable with this type of anglicisms. It is one of many “words” that the world of the company puts on the table: marketing, sponsoring, branding, SEO, target, freelance, brainstorming, know-how … are many of these words that we have all heard at some time and that we are not always sure what they represent. Well, the word coworking is, literally, working with several people in the same space, or, to understand each other better, in the same office, sharing resources and capabilities. However, we like to call it “space”, since the term “office” limits the extension of it and forgets the idea of a close relationship and the fact of sharing something more than an office. Broadly speaking, it is about sharing the workspace, using the same office between different professionals of the same or different companies and different sectors. In this way, expenses and services are shared, while the relationship between different sectors and projects and collaborations is fostered. In addition, a space like this invites movement, companionship, innovation and social involvement. A coworking has a beneficial impact for your community (the coworkers that compose it), your neighborhood and your locality. But coworking is much more than that. The true purpose is to create an environment and a community of coworkers, a space that encourages networking, collaborations, growth and creativity. It seeks to escape from the isolation that exists in a traditional office or in one’s own home; the coffee machine will stop being your best friend and the refrigerator your best counselor. The house will not fall on you again. However, coworking is not as young as they paint it. There is documentation dating back to the 1600s in which coworking was already spoken of as a collaboration between God and his subjects. But, it was in the mid-1990s, in 1995, when one of the first spaces considered as coworking was born in Berlin, Germany. The C-Base e.V. that initiates the project “BerlinBackbone” with a space in which different people who knew each other and exercised their work under the same roof, as a community. Bernie DeKoven is considered by many to be the father of coworking. He was the first to use this term in 1999 to refer to working together and collaboration thanks to the possibilities that computers gave us. In addition, that same year, the first shared offices were born: 42 west 24, New York Share (shared offices in New York). During the first decade of the year 2000 when many coworking spaces began to appear. In 2002, only three years after Bernie gave life to the term, it is in Europe where they are seen growing. In Austria Schraubefabrik appears, a space designed for the community of workers who founded it: architects, public relations, cooperatives, freelancers or micro-companies. In this way they could stop working at home and move to a more friendly space. They themselves proclaim that community as the mother of coworking. In 2005 the first coworking space as such was opened in San Francisco by Brad Neuberg, who offered from 5 to 8 desks a couple of days a week and different services such as; wifi network, meditation rooms, bike rides, massages or shared meals. The space closes only one exercise after giving way to Hat Factory; This was the first full-time coworking space, offering the freedom of a freelance but with all the necessary resources for a workplace. This space gave rise to Citizen Space, which is still open, with venues in Las Vegas, California and San Francisco. Google enters the scene and coworking becomes trendy. The term begins to be part of the database of Google and other search engines. In 2007 it is considered as a trend and this triggers an increase in the volume of searches and other related terms such as “digital nomads”, “shared office” or “shared work spaces”. During the following years, coworking is directly related to the United States. It is not until 2010 when it is taken into account in Europe. In recent years we can see the consolidation of this type of space, the recognition of the working model throughout the world and the wide range of opportunities offered by this kind of services. 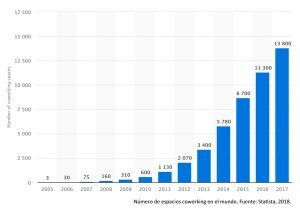 Thanks to Coworking Spain we can know that in Spain there were more than 1,500 coworking spaces at the end of 2016. In 2010 there were around 50. Thanks to the statistical portal par excellence, Statista, we know that in 2017 there were more than 13,800 spaces around the world. In these types of spaces there are different work areas. It usually consists of 3 main spaces: the open work zone, hotdesk or freedom (Vortex Zone in our space), where you find wide tables shared with the rest of coworkers and a more relaxed atmosphere; a private area where you find personal desks and a calmer environment (Focus Area in our space, Vortex Coworking); the meeting rooms; a social zone that can include a kitchen, cafeteria or rest area. At the same time, some have the “virtual office” option, which offers visibility, cost savings and greater flexibility. We will also find different types of coworkers: those fixed or office, that act like any traditional worker fulfilling a schedule; the flexible coworker that has no time of entry or time of departure; and, the night coworker, the one who prefers to work beyond the evening hours. Without forgetting what we now call “digital nomads”, taking advantage of the possibilities offered by the network today: online meetings and being able to work remotely from anywhere in the world. In short, coworking spaces are “accelerators of chance” that have expanded throughout the world in recent years and that offers endless possibilities. They are designed to house creative, sociable, enterprising people who are eager to learn. They are built to break with isolation and create a good atmosphere of coexistence, favoring collaboration and social gatherings. The borders disappear leaving room for hybridization between companies, whether by economic, technological or social sector. In addition, the same facilities can organize events, courses or workshops that complement the training of coworkers who are part of the same community. A place where entrepreneurs and companies live together sharing experiences and resources.